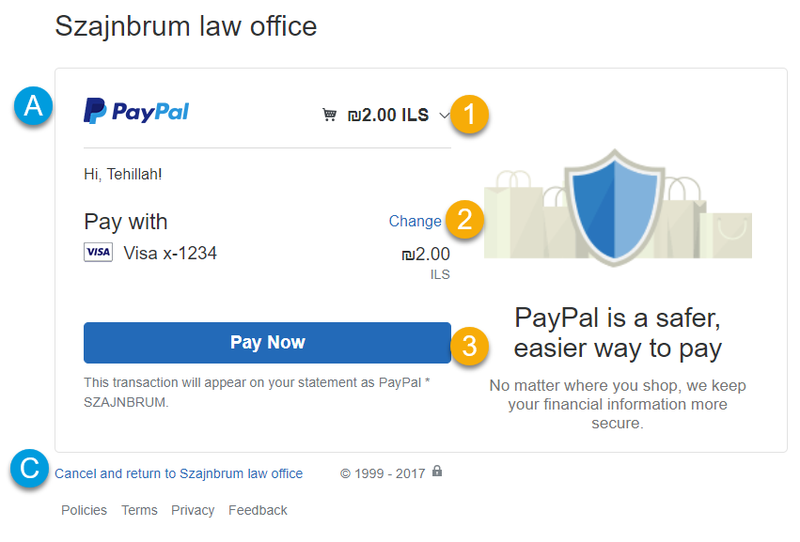 If someone from our office has provided you with a price for a specific type of legal service, and you wish to pay with PayPal, Debit or Credit Card, click the Add to Cart button. In the quantity box, enter the payment amount you were quoted. For example, if you were quoted 1000 shekels, then enter 1000 in the quantity field. 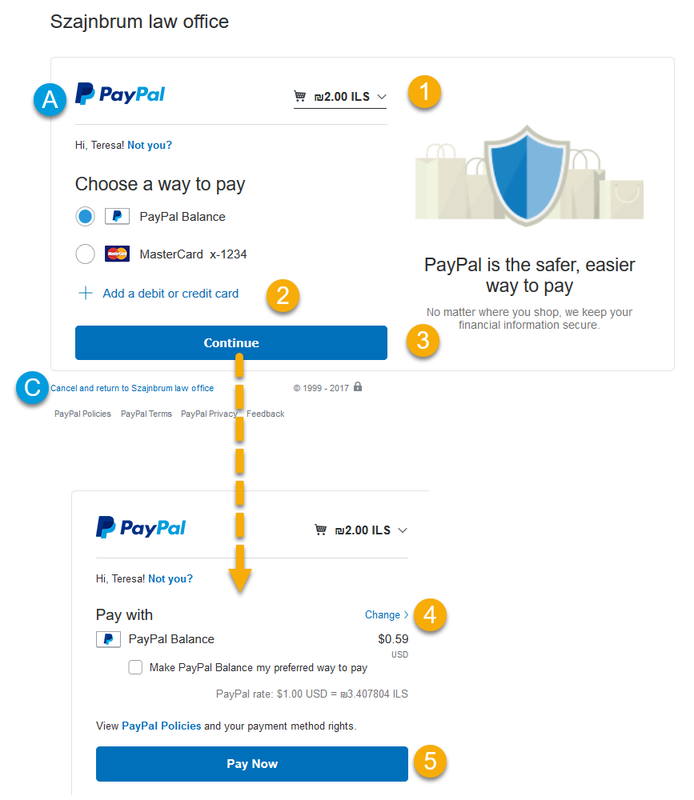 You can pay with your credit card even if you do not have a PayPal account. 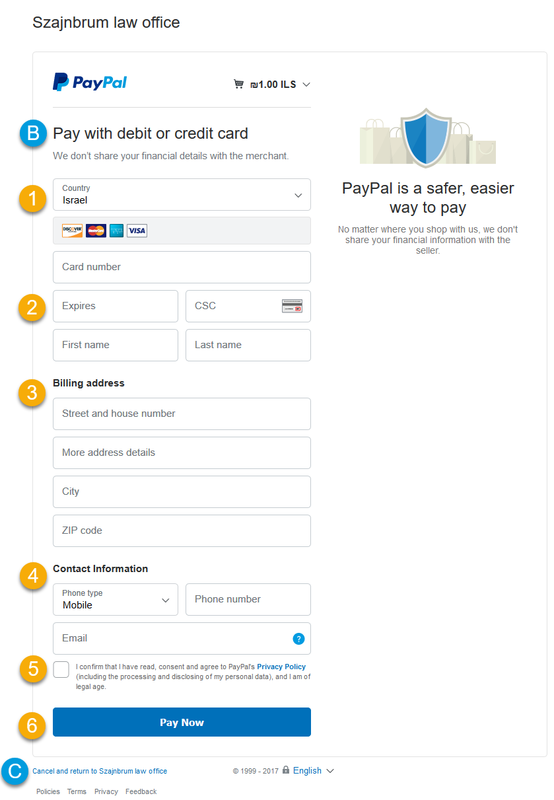 The email address you entered in our cart will display in the PayPal email field, if your PayPal email address is different, then you need to enter it here. 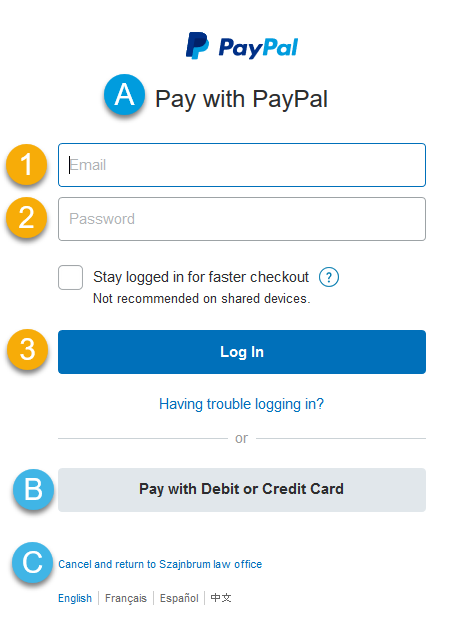 After entering your email address and password, and clicking the PayPal login button, a final checkout screen displays with the following information and options depending upon the country in which your PayPal account is registered. 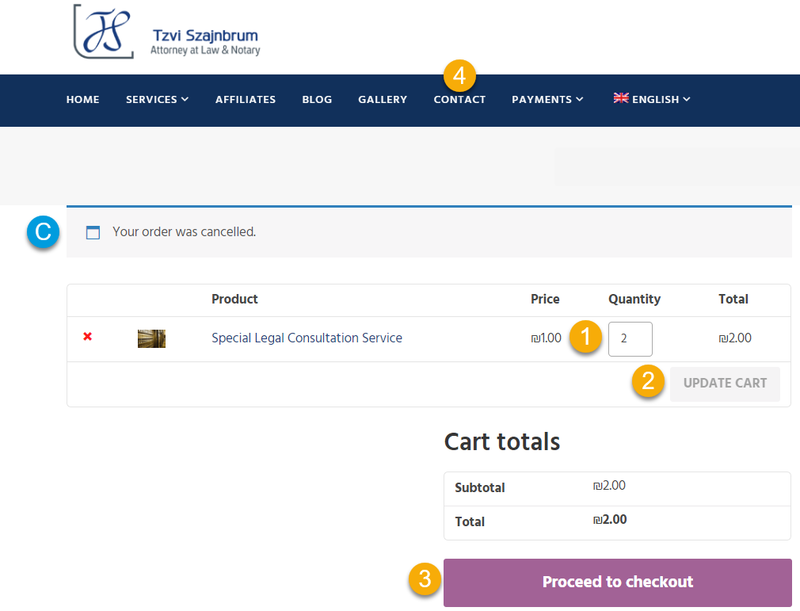 You may click the down arrow beside the shopping cart total for the order details. The default funding source that you have chosen for your PayPal account. This can be payment from your PayPal balance or a credit card type with the last 4 digits displayed. There is an option to change the funding source for this transaction by clicking the Change link. Click the Pay Now button to complete the transaction. The funding source options that you have chosen for your PayPal account. This can be payment from your PayPal balance or a credit card type with the last 4 digits displayed. There is an option to add a new funding source for this transaction by clicking the + Add a debit or credit card link. You’re presented with a final option to change the funding source. If you choose option B, to pay with a debit or credit card you’ll be presented with a transaction form based on international banking laws. Note: this form may vary based on the laws of the country you are accessing the Internet from. If the country that displays in the form does not match the country of your credit card billing address, then select the correct country from the list. Complete the credit or debit card number, expiration, security code (on the back of the card), and the first and last name as they are printed on the card. 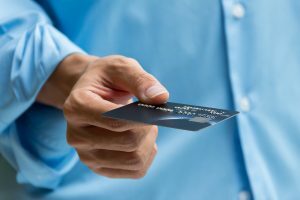 Enter the billing address that appears on the debit or credit card statement. Enter the required contact information (e.g., phone and email address). We will respond to your email with the bank transfer information and details including IBAN or Routing Number needed for you to make the transfer. 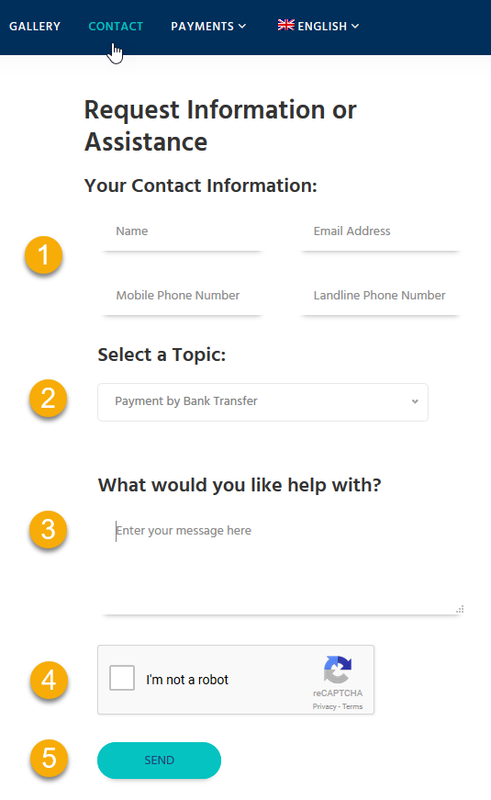 If you have any questions regarding, or need assistance with, our payment options, please contact us.